AproDerm® Ointment is an intensely moisturising emollient that protects, moisturises and soothes skin that is affected by moderate to severe eczema, psoriasis and other very dry skin conditions. Being suitable from birth, AproDerm® Ointment helps prevent skin damage and provides intense moisturisation to help control skin flare ups due to eczema or dermatitis. According to NICE guidelines/ta81, “the greasier the preparation the better the effect1”. Application of AproDerm® Ointment forms a barrier layer that keeps moisture in, whilst keeping infections and irritants out2. AproDerm® Ointment protects and provides symptomatic relief for dry, red, inflamed, damaged and raw areas of skin and can also be used as a pre-bathing emollient to prevent the skin from drying out further. 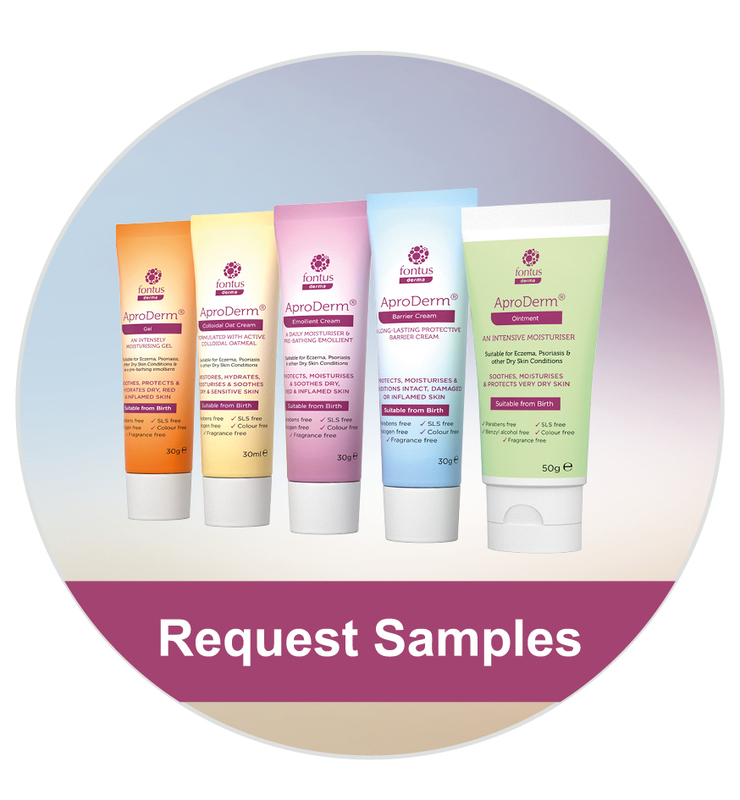 AproDerm® Ointment was developed to be suitable for sensitive skin and the formulation is free from the following potential skin irritants and sensitisers; SLS, Parabens, Cetostearyl Alcohol, Fragrance and Colours. These such excipients are recognised potential irritants and sensitisers as listed by MIMS4 . Irritants and sensitisers can aggravate already sensitive skin which is why such excipients are absent from AproDerm® Ointment so it can be considered that the risk of a reaction to a patient will be greatly reduced thus aiding compliance. An irritant is a substance that causes inflammation to the body in a non-immune way and can affect anyone who comes into contact with sufficient amounts of it for long enough, however those with atopic eczema are more sensitive to irritants. The skin can react straight away (immediate response) or after a period of repeated exposure. Irritants remove moisture (by affecting Natural Moisturising Factor) and oils from the outer skin layer allowing pathogens, irritants and allergens to enter the skin causing inflammation and further damage. A skin sensitiser is a chemical that will cause an allergic reaction when exposed to the skin and, unlike an irritant, it will only affect those who are allergic to it. The initial exposure will not cause a reaction but continued exposure can and once a person has been sensitised to a product, contact with even a small amount of it will cause a reaction. The two conditions allergic and irritant dermatitis may coexist. Symptoms typically seen include skin which can be red, swollen, blistered, dry, thickened, intensely itchy and cracked depending on whether the reaction is acute or chronic. Patient compliance is crucial to successful emollient therapy and studies have shown that educating patients (and parents or carers of children) about the causes of their condition and correct emollient application improves outcomes significantly. In addition to this, NICE Clinical Guideline 57 “Management of atopic eczema in children from birth up to the age of 12 years” also advises that they (patient and parent or carer) be educated by healthcare professionals on quantity and frequency of use of treatments, flare-ups and their management (using the stepped approach plan) and the recognition and treatment of infections. Information on eczema, psoriasis and other dry skin conditions. View or print Eczema, Psoriasis and other Dry Skin Conditions PDFs for patients. As with all emollients, before applying AproDerm® Ointment for the first time, patients should test it on a small area of skin and leave for 48 hours. If there is no reaction or irritation they can then apply all over the affected area. This limits any potential reaction to a small area. To apply, use a clean spoon to scoop out the required amount, this avoids contamination of the ointment. AproDerm® Ointment should be applied regularly, liberally and frequently to the affected area, using gentle, downward strokes, following the direction of hair growth. Rubbing should be avoided as this can cause further irritation and itching (by generating heat) and can also cause folliculitis (as a result of blocking the hair follicles and causing their inflammation). Frequency of application will be determined by severity of the condition and whether more than one emollient is being used. As a general guide, it is recommended that AproDerm® Ointment is applied as often as required as well as being used as a pre-bathing emollient to help alleviate the drying effects of bathing. Patients should take caution when using ointment before bathing as bathroom surfaces can become slippery. AproDerm® Ointment should also be applied after bathing to skin that is almost dry. Because of the greasiness of ointments, some patients may deem them cosmetically unacceptable and be reluctant to use them, however according to NICE guidelines/ta81, the “greasier the emollient the better”1. To increase compliance, encourage your patients to use the ointment at night time and complement this with an emollient cream or gel during the day. Patients should also be reminded to continue applying AproDerm® Ointment once their skin has improved to prevent the risk of flare-ups. Use during pregnancy or breastfeeding is unlikely to have any ill effects when the product is used as directed. For further information on emollient application please visit our How To Apply page. Other useful information for your patients can be found in our printable Tips and Advice section. Store below 25°C. Do not refrigerate or freeze. AproDerm® Ointment is for external use only, if your patient accidentally swallows some of it they should seek medical advice immediately. 1 Nice.org.uk. (2004). Frequency of application of topical corticosteroids for atopic eczema | Guidance and guidelines | NICE. [online] Available at: https://www.nice.org.uk/guidance/ta81 [Accessed 8 Mar. 2018]. | 2 Croney (2016). Treating itchy skin conditions: know your emollients. [online] Independentnurse.co.uk. Available at: http://www.independentnurse.co.uk/clinical-article/treating-itchy-skin-conditions-know-your-emollients/148308/ [Accessed 8 Mar. 2018]. | 3 DM+D March 2018 | 4 Mims.co.uk. (2017). Emollients, Potential Skin Sensitisers as Ingredients. [online] Available at: https://www.mims.co.uk/emollients-potential-skin-sensitisers-ingredients/dermatology/article/882437 [Accessed 8 Mar. 2018]. | 5 Simpson, E., Chalmers, J., Hanifin, J., Thomas, K., Cork, M., McLean, W., Brown, S., Chen, Z., Chen, Y. and Williams, H. (2014). Emollient enhancement of the skin barrier from birth offers effective atopic dermatitis prevention. Journal of Allergy and Clinical Immunology, 134(4), pp.818-823. References used throughout this website are on file. If you would like a particular reference please email us at info@aproderm.com stating exactly which section the reference relates to and the reason that you require it and we will be in touch. You are now leaving the Healthcare Professionals area. You are now leaving the AproDerm website and will be directed to the Fontus Health website. You are now leaving the AproDerm website and will be directed to the AproDerm Shop. You are now leaving the Healthcare Professional pages. When you would like to return simply click the Healthcare Professional icon in the navigation bar.